Hurricane Irma made landfall on September 10, 2017 and caused significant damage to agriculture across much of the state of Florida. Agriculture Secretary Sonny Perdue announced on Monday, July 16, 2018 that agricultural producers affected by hurricanes and wildfires in 2017 now may apply for assistance to help recover and rebuild their farming operations. Signup began July 16, 2018, and continues through November 16, 2018. Due to the large number of eligible producers, it is advisable to call your local FSA office to set an appointment time to discuss the WHIP Program. Eligible crops, trees, bushes, or vines, located in a county declared in a Presidential Emergency Disaster Declaration or Secretarial Disaster Designation as a primary county are eligible for assistance if the producer suffered a loss as a result of a 2017 hurricane. Also, losses located in a county not designated as a primary county may be eligible, if the producer provides documentation showing that the loss was due to a hurricane or wildfire in 2017. A list of counties that received qualifying hurricane declarations and designations is available at www.fsa.usda.gov/programs-and-services/disaster-assistance-program/wildfires-and-hurricanes-indemnity-program/index. 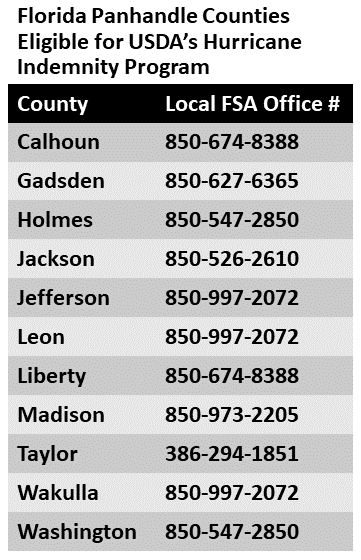 Eligibility is determined by Farm Service Agency (FSA) county committees. For more information on FSA disaster assistance programs, please contact your local USDA service center or visit www.farmers.gov/recover/whip, or use the following link for the 2017 WHIP Fact Sheet.